Tomatoville® Gardening Forums Index > What Else Do You Grow? > Fruit, Flowers and Ornamentals > What's blooming now? So pretty! Thanks for posting. I have several. I had to put them in the garage this past winter due to two rare freezes. Even then, it was 30 degrees in the garage. I was afraid they wouldn't make it, but they did. They smell like lemon cotton candy. The vines have been loaded with fruit and finally starting to ripen and fall off the vine. I have plenty of FRESH seeds if anyone would like some. Very easy to germinate since they are FRESH seeds. No scarification needed. Just warm soil and sunny location. Should germinate in 10 to 12 days. Have plenty of FRESH seeds for this warm climate variety. I have yellow and a yellow/red mix variety. Have plenty of seeds if you would like some. I'm looking for the PINK variety. They grow fast. The stems do have small thorns so be careful. Butterfly magnet for sure! Last edited by Gardenboy; July 13, 2018 at 12:18 PM. Gardenboy, is it possible to grow these beauties in containers to be brought indoors in winter? If so, I would really like to get some seeds. Thanks. Passiflora will tolerate temps to 30 degrees and Dwarf poinciana will not tolerate any frost. It will die in cold but will sprout again once it dies back and start to grow again in spring. BOTH get quite large..vine is over 20ft. long in one season and Dwarf poinciana will get to 8 feet with proper pruning. I have fresh "FLAME" marigold seeds if anyone would like some. Perfect flower companion for your tomato and peppers plants. 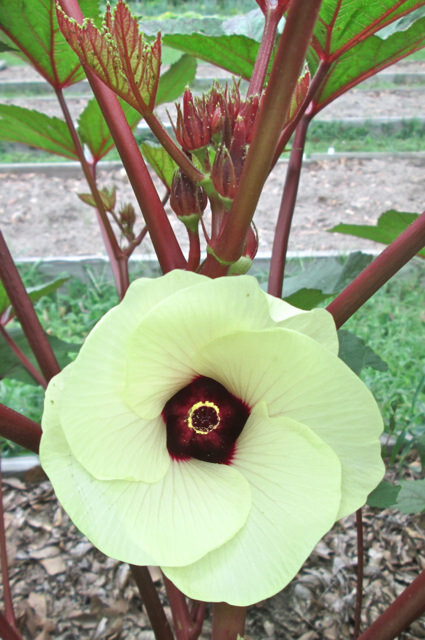 Just an okra flower (in the hibiscus family) but pretty. This particular variety is 'Jing Orange' with red tinged stems and leaves. 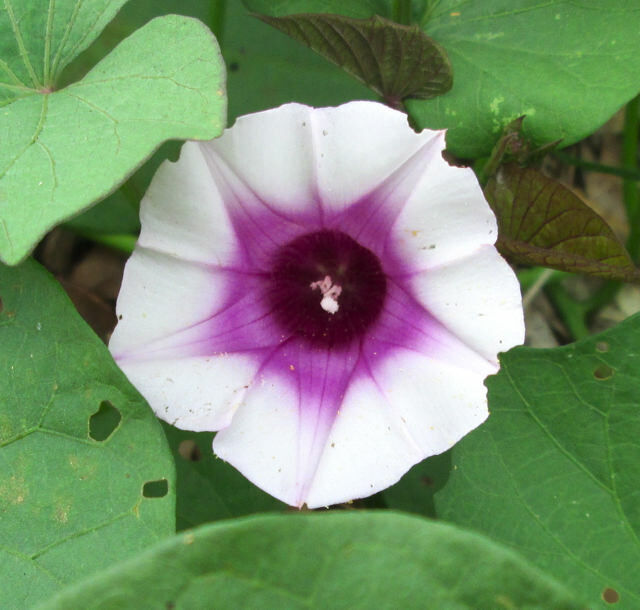 A sweet potato flower (in the morning glory family). This one is 'Jewel'. My variety of passiflora is sterile. I have a yellow orange Poinciana too, but it's not as large as yours is. I bought it from a nursery a couple of weeks ago. I would take some fresh seeds in an instant, but I don't have any room that is sunny. Heat does not bother them. Donna your shrimp plants put mine to shame. I have two that are grown in pots. I bring them in for the winter where they get leggy and spindly. Yours are so full and dense, they are just beautiful. The people as well as the birds here love them. Thanks, Miss S. I have a long growing season.